Don Alfonso wagers with Guglielmo and Ferrando that their devoted girlfriends are unfaithful. Incredulous they accept, pretending to go to war only to return disguised as dashing Albanians! Chaos ensues in this light-hearted tale of love, fidelity, and human infallibility set to Mozart’s glorious music. Described by Opera Today as ‘compulsive and enjoyable’, Dulwich Opera Company’s vibrant production features an exciting cast of young professional singers. 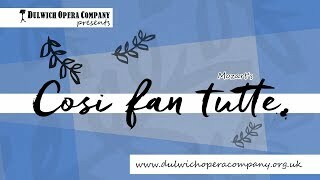 A chance to see a most-loved opera performed in the original Italian with English surtitles. If you have problems with your vision please alert our Box office so that they can reserve you seats closer to the surtitle monitors.